Many of us grow up with visions of Santa somehow magically slipping down the chimney with his bag of toys slung over his shoulder on Christmas Eve. What is even more "interesting" is that we believe he can even do that when we don't even have a chimney on our home! Yes, this enchanting image of Santa has delighted children and adults for decades. I think there is always a part of us that wants to believe. Not only is this picture of the jolly ole Santa with his bag of toys quite beautiful, it would be a lot of fun to cross stitch this pretty image. I love the snowy rooftop and snow laden ground in this picture with the midnight sky as a lovely contrast in color. The white and blue make the perfect background for the red suit that Santa is known to wear. The bag of toys hold promises of a joyously wonderful discovery under the Christmas tree on Christmas morn. This cross stitch kit includes the printed sailcloth stamped for cross stitch. It also includes the thread and a needle so, no need to go searching for supplies. 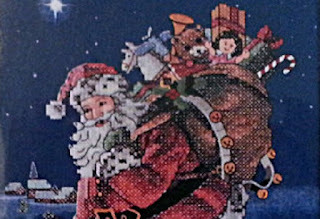 What a beautiful Santa cross stitch! oh, this is gorgeous, absolutely love this! 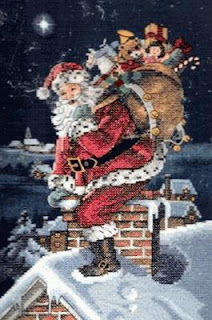 My mom used to do needlepoint and my grandma too, and we have their worked in our home - would love to feature this santa, wow. i lost the instruction for this does anyone have them that they can sent?